Issue XIX Vol. 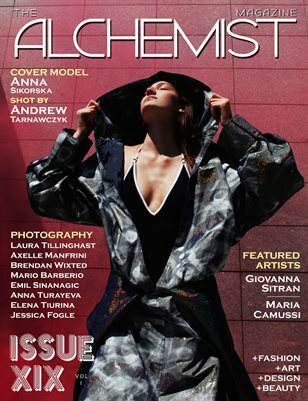 I of The Alchemist Magazine features model Anna Sikorska on the cover photographed by Andrew Tarnawczyk. The issue also features photography editorials by: Laura Tillinghast, Axelle Manfrini, Brendan Wixted, Mario Barberio, Emil Sinanagic, Anna Turayeva, Elena Tiurina and Jessica Fogle. Featured Artists: Maria Camussi and Giovanna Sitran.